After some serious home improvement projects I am happy to say that we are almost done with our home. 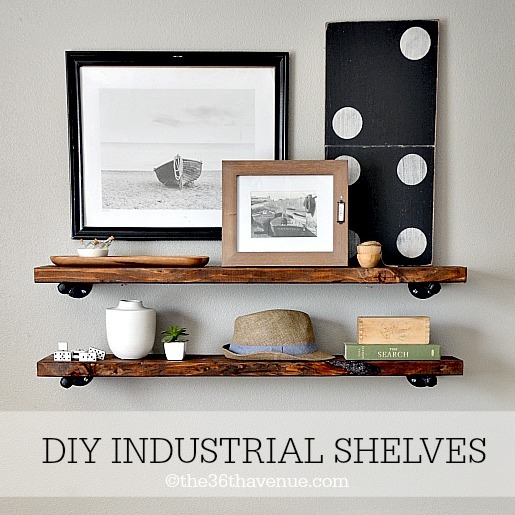 Today I’m sharing my new DIY Industrial Shelves. After looking and looking for the perfect wall decor for our front room walls and not finding what I wanted I decided to make my own shelves. You’ll be surprised by how easy they are to make! I think they are the perfect addition to our front room! Don’t you love the custom large DOMINO from Barn Owl Primitive? So cute! How to make Industrial Shelves? 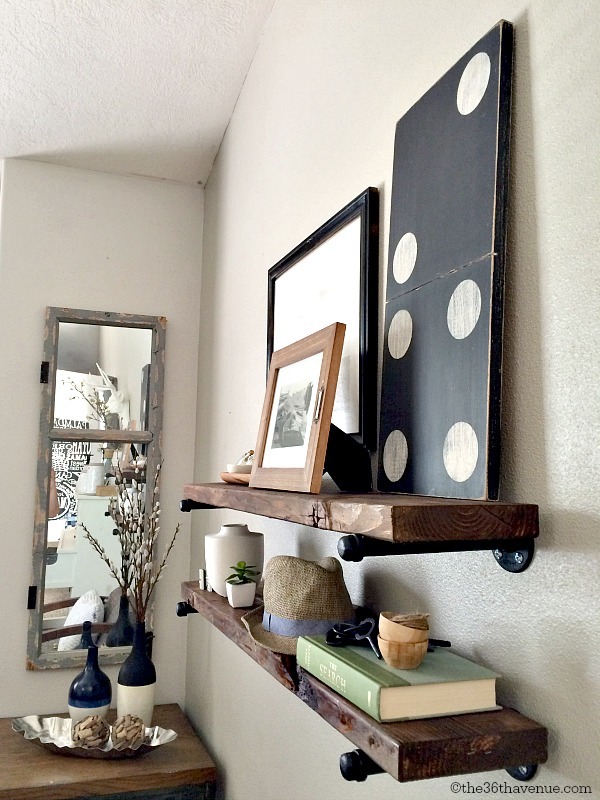 I came across a great tutorial over at Seventh House On The Left, that shows how to make these shelves. Before you head that way here are a few extra tips from me! 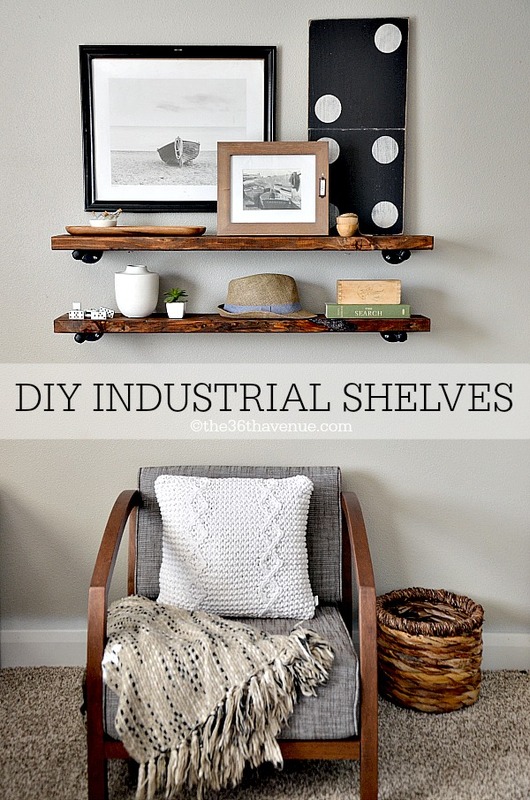 The older the wood looks, the more rustic and industrial your shelf will turn out. Make sure to look for pieces of lumber that have knots and tons of character. HOWEVER, make sure the piece of lumber you purchase is straight, you want the shelves to sit without tilting. If the wood is warped the shelf will also be uneven… Not good! Because you’ll be using a solid piece of pine the shelf is going to be a bit heavy. since the drywall is not strong enough to hold the weight of the shelves. I used anchors and screws #14-16 x 1-1/2″ and they worked perfectly! I didn’t sand the wood before staining it. 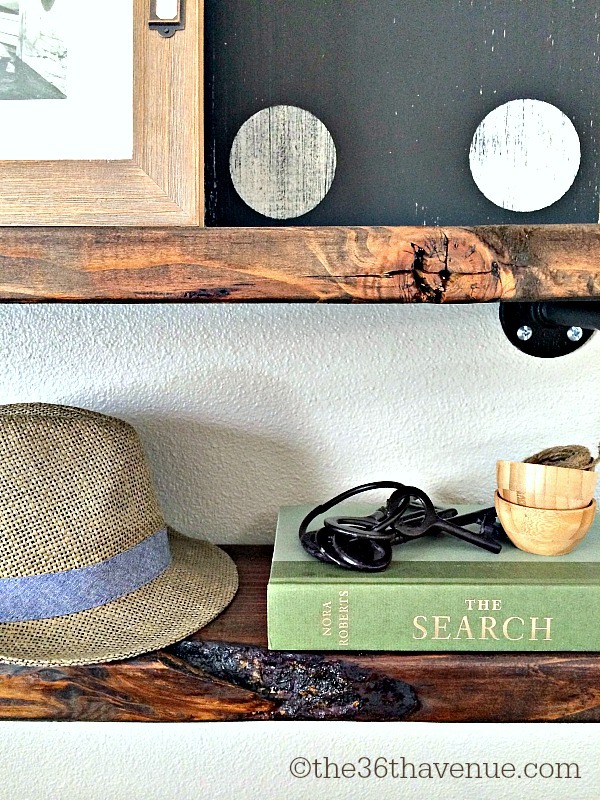 I wanted my shelves to look like they came from reclaimed wood instead of a piece of lumber that I purchased over at the store. After the stain is dry I recommend using a clear glaze to finish it up. This will not only protect the wood but will keep the rich tone of the color for a long time. You can find HERE the step by step tutorial by Seventh House On The Left. 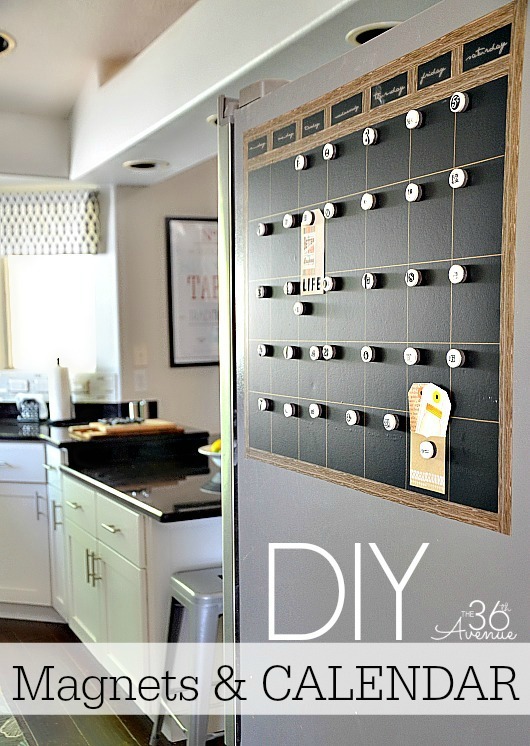 Here are some other DIY Home Decor Ideas that you may like! 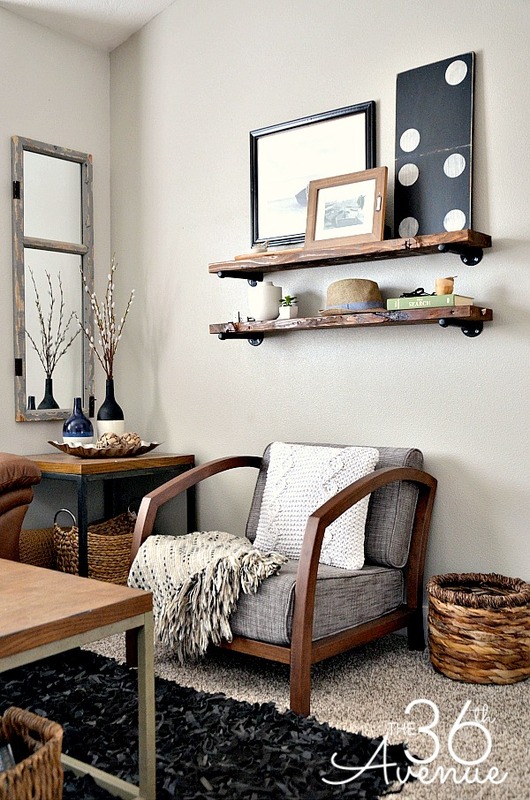 These rustic wood shelves are fantastic! Where did you get those brackets? Love these! Did you also make the domino?! just curious where the wooden chair was purchased? love it! I’ve had these on my to-do list for months. I want some exactly like it over my toilet. 🙂 Yours turned out awesome. Love, love. Absolutely love this shelf! Pinned! Oh I am so loving these! I may just have to do this in several rooms here. Gorgeous my friend! Thank you so much Gina… Love you to pieces! Love these shelves! I’m not very handy but I think I might be able to do those–yay!! 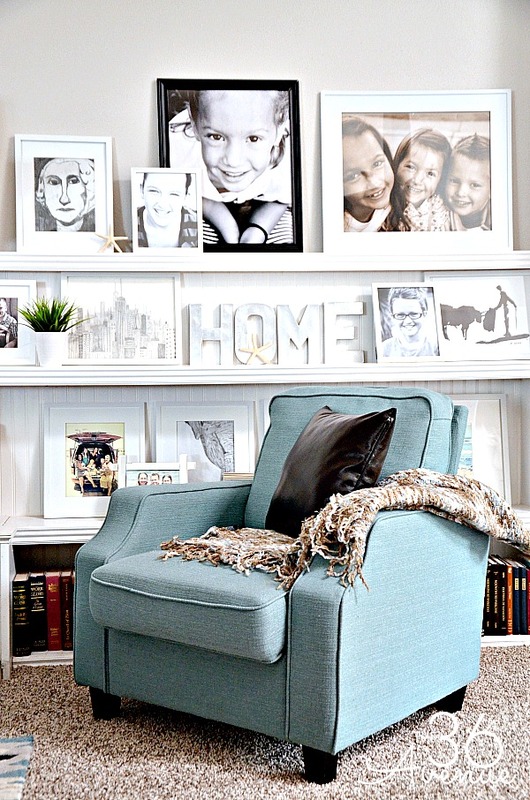 I’m also wondering where the chair below the shelves comes from; it is beautiful! They were so easy to make… I am sure you can do it!